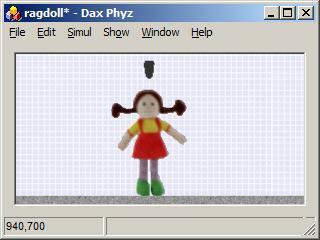 Everything you create in Dax Phyz can be saved to file, copied to the clipboard, cut, duplicated, exported, pasted, loaded or imported as a model or scene. To use one of the models or scenes below, you can either save it as a file and use File/Open, or you can copy the text of the model to the Windows Clipboard and use Edit/Paste. Use the F5 key to make the model come alive (turn physics on). One of the earliest video games, the 1972 classic Pong led to the start of the video game industry. 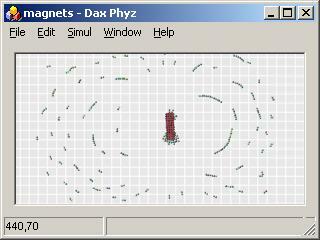 Dax's version exploits Phyz Logics and soft constraints for an amusing mix of modern and antebellum gameplay. Use keyboard keys A,Z and K,M to control the paddles. A metaballic stew, cooked by chaotic cog-wheel driven pendula. 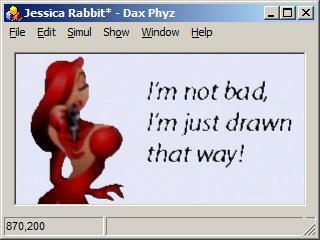 Original artwork 125 times a second. Real or fake? 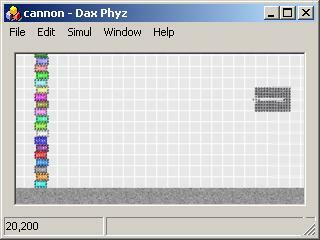 The counter-intuitive answer can be demonstrated in Phyz (this didn't convince Dax, however, since "Phyz is only a program"). The hammer's centre of mass is displaced from its rotational axis, creating a torque which keeps the ruler from rotating (this didn't convince him either). 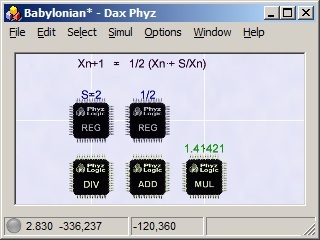 This model utilizes the continuous nature of Phyz Logics to implement the Babylonian method to compute the square root of 2. 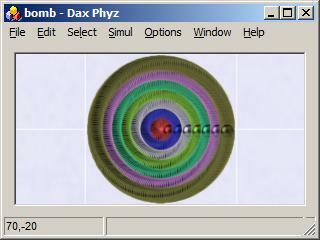 Imagine a disc viewed from its side. If the disc is spinning, a point on the left side will rotate to the right side after half a revolution, shifting momentum causing a gyroscopic effect counteracting torque around the Z axis. 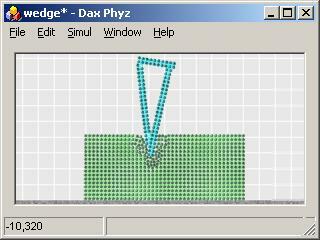 Although Dax Phyz is 2D, a spinning disc can be simulated using Phyz Logics to continuously swap the positions of left and right vertices. 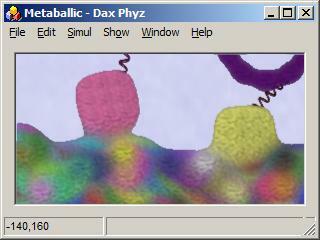 3.446 metaballic vertices with colour information imported from a bitmap. 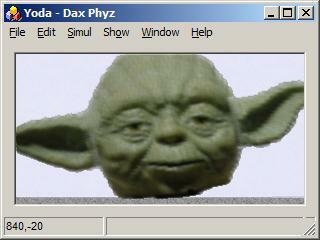 Replace Yoda's rods with springs (use the Edit menu) to cause a great disturbance in the force. 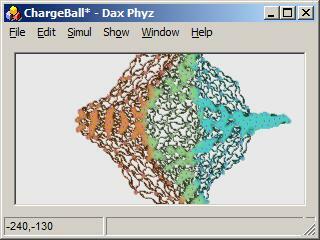 Charged vertices connected by springs, exhibiting complex behaviour in their search of equilibrium under the influence of competing attractive and repulsive forces. 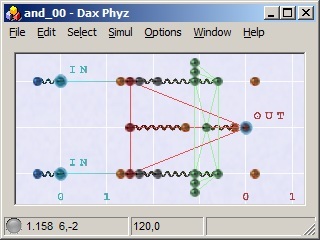 Illustrating the similarities between electric and magnetic dipoles, and how several small dipoles can be combined to form a bar magnet. "Why am I lighter in the water?" Dax asked after a recent swimming lesson. 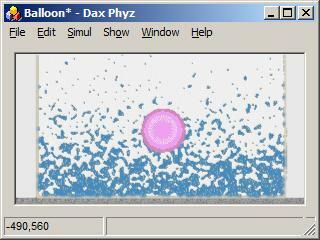 Dax, like balloons, floats since there are more particles pushing on the bottom than on the top, as in buoyancy. Sink it by deleting a vert. 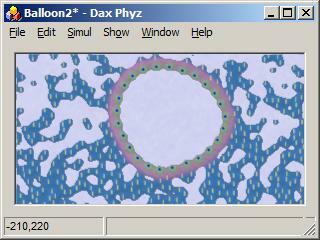 Same-signed charges repel one another, a fact used to inflate this balloon until it floats. Too much charge and it pops in a satisfying way (turn Breakable constraints on). Heated monatomic gas: Pressure from the force exerted by the "hot" vertices jettisons the rocket, as in kinetic theory. Gas is "ignited" periodically by the hot section of the flywheel, causing the closed system to go through the states of a Carnot cycle. "Why are the towers so high?" Dax asked as we crossed the Great Belt Bridge on our way to Legoland. Watch the cable break when they're not. 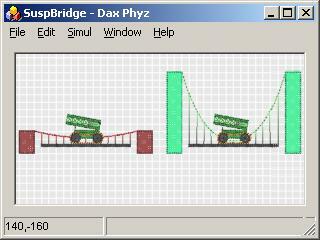 Measure the forces of the suspension bridge above. 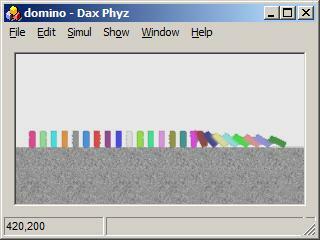 Start PhyzLizp, type (feval "SB.lzp") and press Control+Enter. 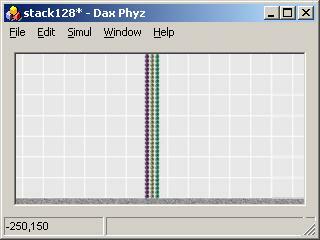 Dax likes'em high, and usually isn't satisfied with less than 600 layers; here's a mere 128. A chain wrapped around two rocket-propelled wheels. Because of the large "area" of contact, the band can climb over obstacles much better than standard wheels. The act of destruction is surprisingly satisfying for aspiring physicists. The modern approach, equally educative. 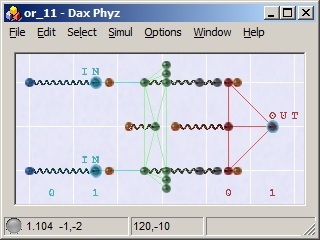 The simplest logic gate in Dax' mechanical computer, with a spring driver to try it out. Select the spring and adjust its rest length from 20 to 60 to change its input from logical 0 (left) to logical 1 (right). A not-gate is also simple to implement with an actuator. 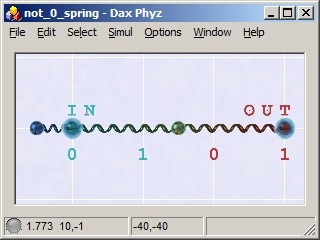 In Phyz, springs can act as actuators. A mechanical or-gate. 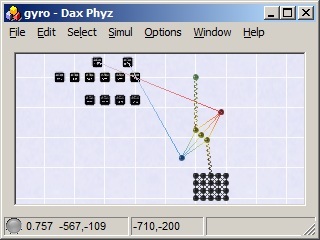 As usual, logic state is represented by position; left for 0 and right for 1. A mechanical and-gate. 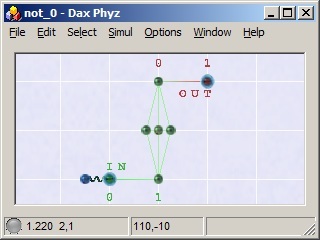 Compare with the or-gate above. 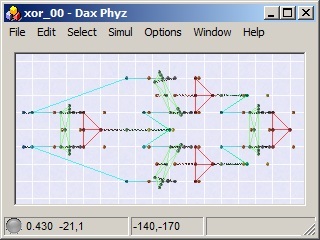 A mechanical xor-gate, constructed from or- and not-gates. 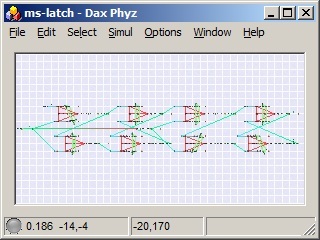 The not-gates are implemented as actuators with amplifying buffers. An alternative implementation of the xor-gate, based the observation that A XOR B is TRUE iff A != B. 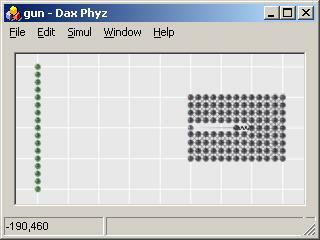 The resulting device is 7 times less complex than the NOR-based version. A mechanical master-slave flip-flop with clock. 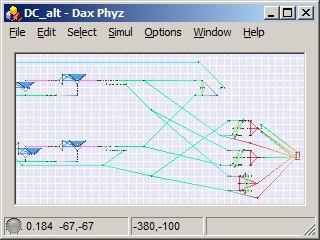 This more direct approach implements the flip-flop without any logic gates, yielding a 3 times less complex device. 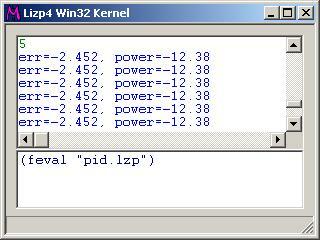 Just for fun, the input is connected to the inverse of the output. Two flip-flops, some logic to add 1, some to display LCD-like digits and voilà - we have a 2-bit digital counter. 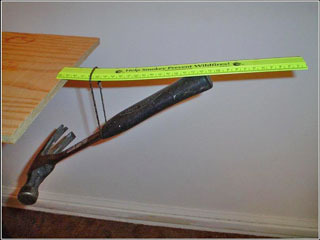 An example of how springs can be used as meters and actuators. 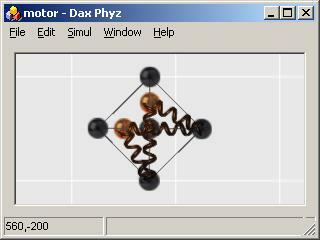 Two "meter" springs with k=d=0 measures distances; two "actuator" springs applies suitable forces, proportional to the meter springs. 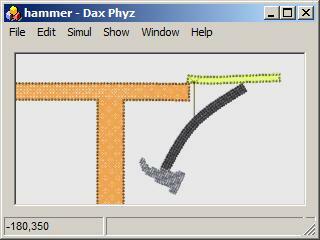 Tweak the k and d parameters of the actuators to make the motor stronger or weaker. Strange creature which jumps and twists trying to pass obstacles. 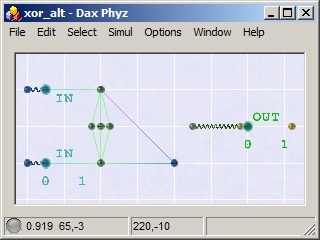 An inverted pendulum, to illustrate how PhyzLizp can be used to control Phyz and create non-linear constraints. 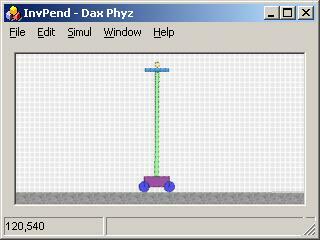 The PID controller script below tries to keep the inverted pendulum from tipping over by adjusting the power of the rocket motors. 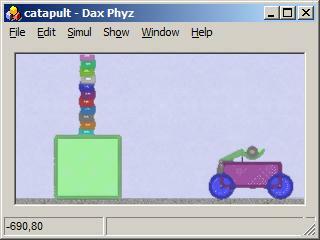 A PID controller implemented as a PhyzLizp script, which tries to keep the inverted pendulum above from tipping over. A 10-round revolving gun on wheels. 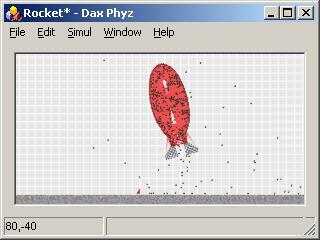 With the PhyzLizp script below running, use the arrow keys to move the gun and Enter to fire. Count the number of remaining verts to keep score (lower is better). 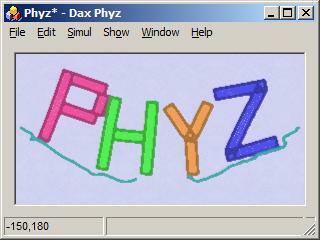 A PhyzLizp script to control the gun above. 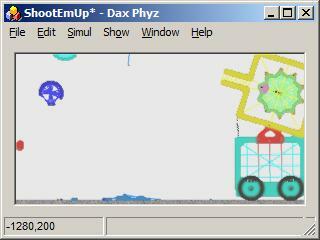 With Phyz running the scene, start PhyzLizp, type (feval "ShootEmUp.lzp") and press Control+Enter. 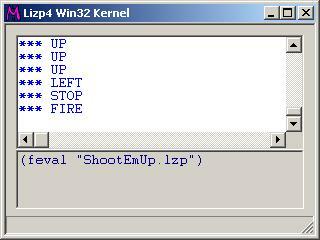 Or simply start ShootEmUp.exe in this package. Elastic collisions. Or nearly so. The system's kinetic energy and momentum are decreasing even though friction is off, can you figure out why? The energy required to topple each domino is less than the energy transferred by each impact, causing a self-sustaining domino effect. 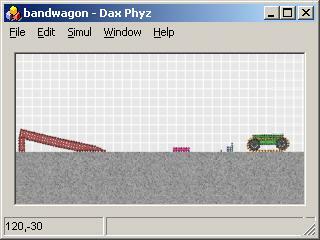 However macabre, this 10.000+ item scene is used to regression test new Phyz versions for performance and determinism. The weight is super dense; using a spacing of 2 it weighs 1.181 verts. All in the name of ragdoll physics. Forced advection. 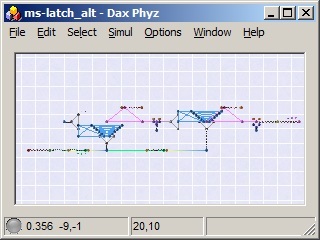 Or two mixers and some tubes, as Dax would have it. 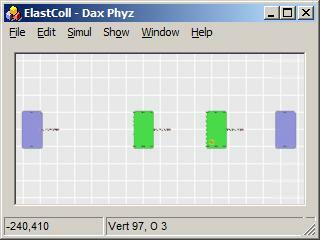 Select a vertex and try to predict its path. The physical properties of this scene are similar to those focused on in the balancing hammer scene. This one packs some serious punch. 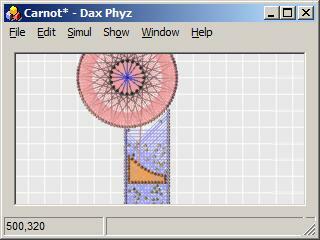 Super-dense (spacing 1) ellipses and explosive sticks; with Breakable constraints enabled, holes are guaranteed. Soft-body metaballic letters on a chain with a weak link.